PEBBLE BEACH, Calif. – Aug. 04, 2016 – Automotive Fine Arts Society member Stanley Rose is once again breaking tradition with two new pieces that will debut at the Pebble Beach Concours d’Elegance on Aug. 21, 2016. A Brit living in France, Rose is venturing across the Atlantic by embracing Americana legends ranging from B.B. King to a ’59 Cadillac. Those attending the Concours can experience the unconventional yet breathtaking genius of this esteemed AFAS artist from 9:00 a.m. to 4:30 p.m. on the grounds of the Lodge at Pebble Beach in California. 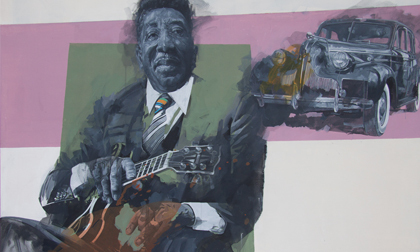 “The Thrill is Gone” doesn’t apply to Rose’s painting of the all-star American “King of the Blues” – the one and only B.B. King. This hit painting, a 57.5” x 45” oil on canvas entitled “Muddy’s Buick Blues”, mixes B.B. King with an iconic 1956 Buick convertible. Coloring outside the lines of typical automotive art, Rose includes a mixture of meshed lines and bleeding hues to capture King and the Buick in a fluid 50’s Memphis-blues feel. Another atypical yet astounding painting is Rose’s “Cadillac Ranch,” which spotlights one of the most popular artists in the nation, Bruce Springsteen, or as his fans know him, “The Boss”. This 57.5” x 45” oil on canvas depicts the famous Springsteen passionately strumming away in the foreground with the incredible 1959 Cadillac car sitting boldly behind him. Just like Springsteen’s energetic rock tunes, Rose paints vibrant color blocks spilling over “The Boss” of rock and the boss of big iron, the American Cadillac. In 1984, Rose moved to France in order to paint full-time, allowing the relationship between man and automobile to be his inspiration. Rose established his studio aboard a Dutch barge in the heart of Burgundy but subsequently moved to a 14th century chateau that houses a collection of cars that include four Hispano Suizas, a Ferrari 330GT and an Aston Martin DB5. He started exhibiting throughout Europe in 1988, was welcomed as a member into the Automotive Fine Arts Society in 1999; he regularly exhibits at Pebble Beach. Earning an array of awards, Rose received the Lincoln Award in 2002 and 2008, the Peter Helck award in 2001 and 2008 and rewards of excellence on six occasions. He continues to live in France with his wife Avril. To learn more about Stanley Rose and his work, visit www.stanley-rose.com. AFAS was established in 1983 by a group of artists who are acknowledged by critics to be among the best in their field. Members work in many diverse mediums including oil, watercolors, acrylics, wood, gouache, pen & ink, clay and metal. AFAS and its members participate in select shows across the country including the Pebble Beach Concours d´Elegance, Dana Point Concours d’Elegance and the Amelia Island Concours d´Elegance. Information about AFAS is available at www.autoartgallery.com or by calling Tyler Weiland at 214.520.3430 ext. 302 or tweiland@tprm.com.